Let’s consider how to set the same desktop background (wallpapers) on all domain computers using Group Policies. As a rule, it is important for large businesses that require all employees using the same corporate desktop background. We’ll need a file containing the image you want to use as a desktop background. The format of this file can be BMP or JPG. It is recommended to test if the file view is correct on the screens with different resolution. This file can be copied to all computers in advance, but it is more convenient if the clients take it from the network folder. 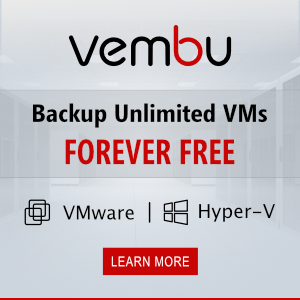 As such, you can use a file server, a SYSVOL folder on the domain controllers or a DFS folder. We have chosen the second variant for our distributed network, since the SYSVOL contents is automatically replicated among all DCs and allows to reduce WAN traffic between the branches when the clients are getting the image file. Then open GPO Management console GPO (GPMC.msc). Create a new policy and assign it to the necessary OU with the users. (In our case, we want the policy to be applied to all domain computers and servers, so we just edit the Default Domain Policy.) Open the policy in the edit mode. We need the settings in the section User Configuration -> Policies -> Administrative Templates -> Desktop -> Desktop. 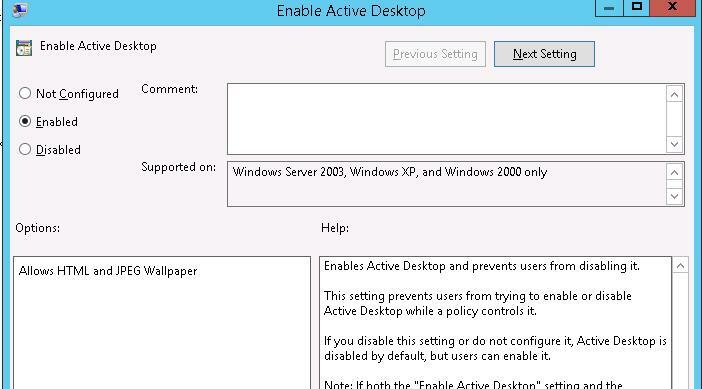 We have to enable the policy Enable Active Desktop. Then enable Desktop Wallpaper policy. In the policy settings, specify the UNC path to the image file and select Fill as a wallpaper style. Tip. As a rule, Fill wallpaper style looks well almost at any screen resolution. To make sure that the policy has been enabled, log off and sign in again. The set wallpaper has to appear on your desktop. If you have to prevent users from changing the wallpaper, enable Prevent Changing Desktop Background policy in User Configuration -> Administrative Templates -> Control Panel -> Personalization. Tip. 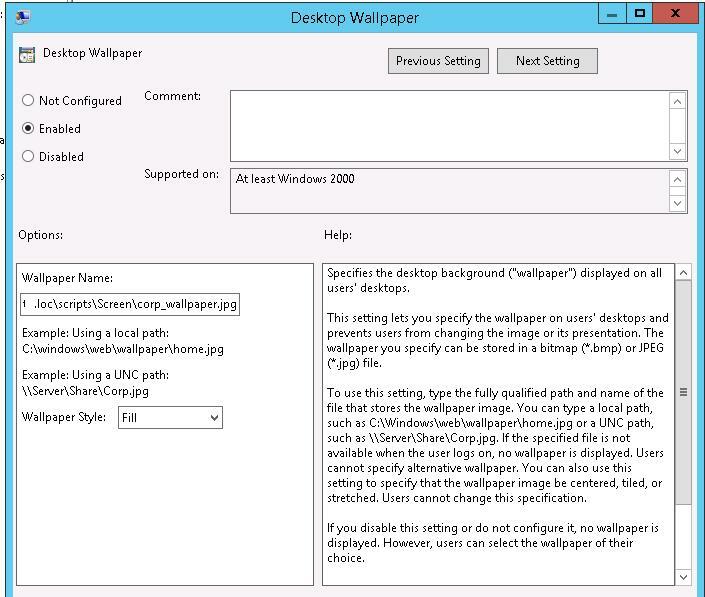 You can also set a file with the background wallpaper using the registry by changing the path to the file in the Wallpaper parameter in HKCU\Software\Microsoft\Windows\CurrentVersion\Policies\System. 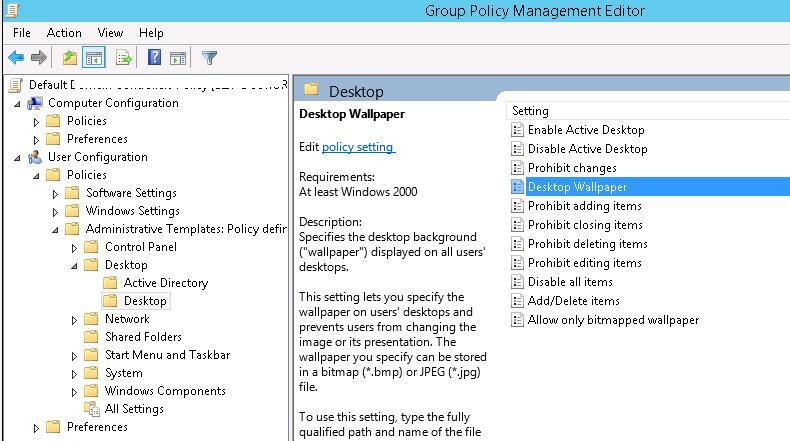 It is convenient to change the value of a registry parameter using the GPO extension — Group Policy Preferences, which allows to implement the scenarios of assigning different wallpapers to different groups of users. Group policy works only once for win 10 clients. I mean, when a user login to a win 10 client PC, It gets the wallpaper from server. Now if we change the wallpaper on the server (By replacing that .bmp file with same name) it never changes on client computer. However if a new user login to the same PC, it gets the new wallpaper. This won’t work for a Computer object OU as desktop wallpaper is User config? You need loopback enabled right?? In this example GPO is targeted to the users OU. If you want apply background policy to OU containing computers, you should enable loopback mode. I need your help How to change the wallpaper on a daily or weekly basis? but having GPO. I think you’ll have to use the scheduler tasks or PowerShell scripts to change the path to wallpaper file in registry. 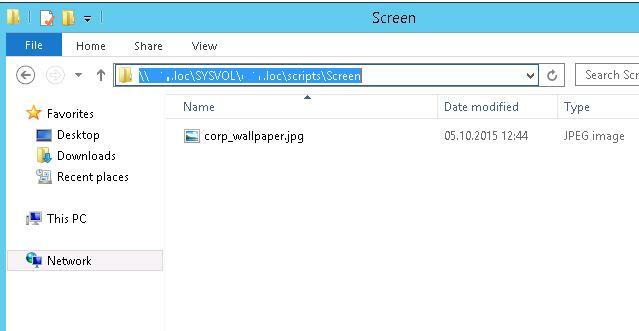 Also you can daily replace shared wallpaper file \\woshub.loc\SYSVOL\woshub.loc\scripts\Screen\corp_wallpaper.jpg using the task scheduler on DC. You are currently applying problems, I mean that it is updated automatically every day. echo Listo!! El fondo de pantalla ha sido cambiado satifatoriamente! echo Esperando 5 Segundos para finalizar……. I was able to apply the indicated script every day with 20 wallpaper, however, I have noticed that sometimes the same image is repeated a few times. How can I solve so that the same image is not repeated in those 20 days? so that all the wallpaper will be applied. Greetings and thanks in advance for your answers. Ok excellent, they also gave me that same idea and it works for me. I think it was the most practical and uncomplicated.